Finland’s elections failed to provide an edge to either of the country’s candidates to succeed Mario Draghi as European Central Bank president. Former ECB policy maker Erkki Liikanen and one-time European Commissioner Olli Rehn are both in the running for the top job in Frankfurt. Rehn, 57, currently is Finland’s central bank chief, the role previously held by Liikanen, 68. While the Social Democrats -- Liikanen’s party -- won the most seats in the vote on Sunday, its victory was by the tightest of margins. The election has left a fragmented parliament and set the scene for tough coalition talks. 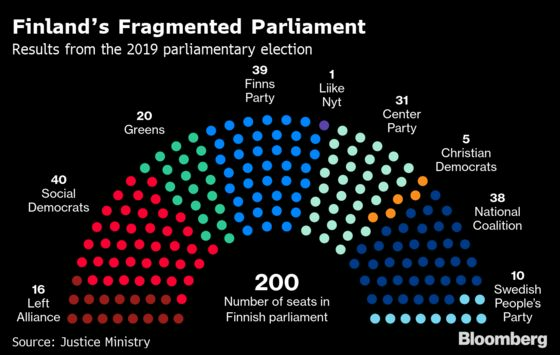 With 40 seats, the Social Democrats have just more than the nationalist Finns Party, and are nine ahead of the Center Party, with which Rehn is affiliated. On the surface, the result looks to give Liikanen a small advantage. But there’s a chance the Social Democrats end up ruling with the Center, and choosing whom to back could be tough for the government. It’s not clear if the issue of the ECB candidacy will feature in any coalition negotiations, which are set to be lengthy. 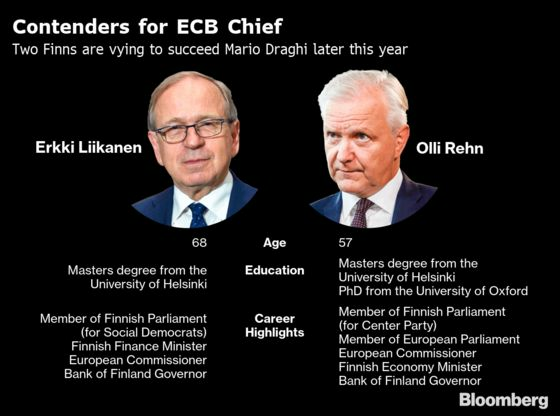 While both are very credible candidates to become ECB president -- Liikanen spent 14 years on the Governing Council and Rehn was a commissioner during the euro-area debt crisis -- they have also been put in the spotlight as compromise figures. That could happen if there’s a impasse between Germany and France over the top EU jobs up for grabs in the coming months, with Finland providing a potential Northern European alternative. Draghi, an Italian, is due to retire at the end of October. 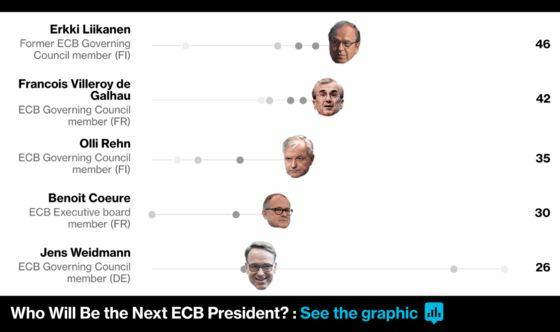 Read More: Who Will Be the Next ECB President? Haggling between governments over the ECB job, and the presidencies of the commission and the European Council, probably won’t kick off until after European elections next month. If Germany wants the ECB role, their candidate to replace Draghi is probably Bundesbank President Jens Weidmann. France’s options are ECB Executive Board member Benoit Coeure and Francois Villeroy de Galhau, governor of the national central bank.